Students in the Urban Studies Certificate program lead an event to share research findings on how the University of Wisconsin-Parkside land was purchased as a compromise between two cities: Racine and Kenosha. Held in MOLN 226. The Student Center is a place to grab a quick bite, meet a friend for coffee, hold a meeting or simply sit in a comfortable chair and study. 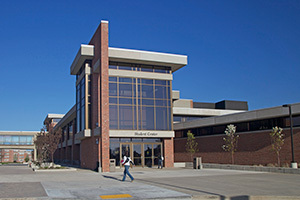 It also houses Academic offices such as Admissions, New Student Services, and the Student Involvement Center.